Hooked on Needles: Piecing a Quilt Backing ~ Do you? How to piece the backing for a quilt is something I learned of necessity. I used to limit myself to making baby quilts that could be finished quickly and either tied or loosely quilted on my sewing machine. I would pick a solid fabric that coordinated with the front and use it as the back. Easy peasy and not too expensive. But then I started making bigger quilts with fabric lines instead of picking a few random fabrics that sort of went together. When possible, I like to choose one of the fabrics in the line that is made in double wide, so all that is needed is a little trimming to make it ready for the long arm. But that can also add quite a bit to the cost of making the quilt. I have also discovered that, when using pre-cuts, there is not always enough leftover fabric to piece a backing, so purchasing yardage is necessary. But sometimes the design of a quilt leaves some blocks or motifs from the front unused and available to be pieced into the backing, which is a look that I just love. This is what happened with the Cartwheels quilt top I made not too long ago using the Fandango fabric line by Kate Spain. I had a number of leftover pieces, plus I had been able to purchase some odd cuts of several of the fabrics in the line at a great low price, so piecing the backing would naturally be the thing to do. 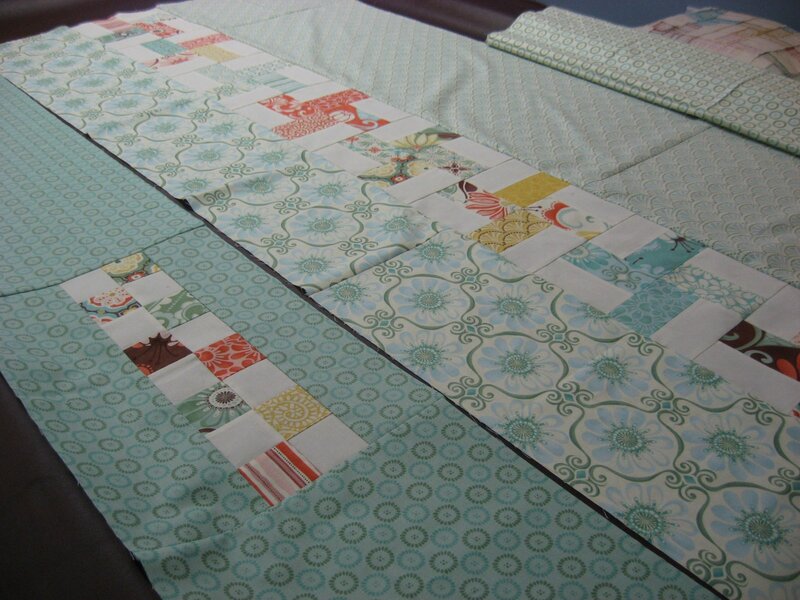 The fun thing about piecing a quilt back is that there is no right or wrong way to do it. 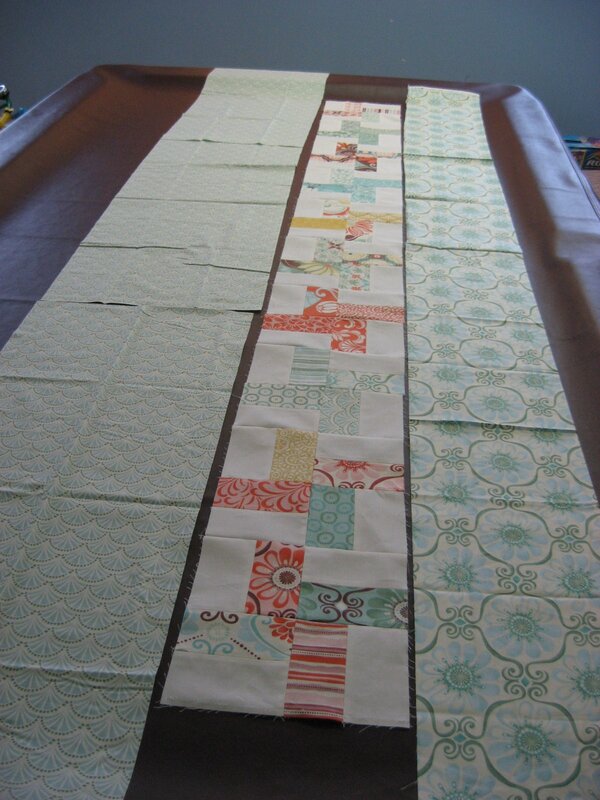 Just start sewing fabric together until you have a piece big enough for your quilt! 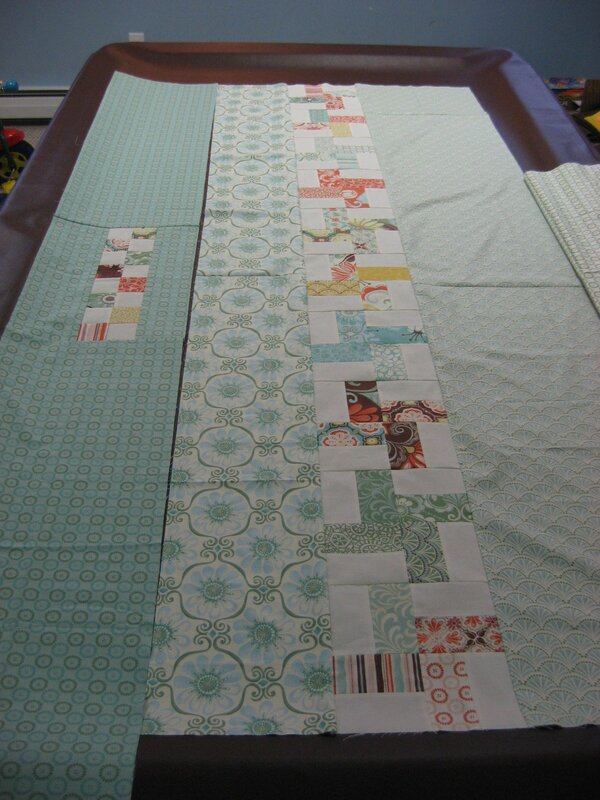 To start this quilt back, I pieced all my leftover blocks into cartwheels and made a long strip that will go up the length of the quilt back, most likely not in the center. Then I chose one of the fabric cuts that was mostly red and pieced it into two long strips, one for each side of the cartwheels strip. I decided I didn't like the cartwheel strip surrounded by red, so I chose two of the lighter fabrics and pieced them into continuous strips, one for each side of the cartwheels. I also had some of the cute little postage stamps leftover from the front which I pieced into a strip of fabric to go up the length of the quilt back as well. I originally wanted to make this little postage stamp piece go width-wise, but when I cut the yardage of the fabric it was being pieced into, I calculated incorrectly and ended up with pieces that were not as wide as the postage stamp piece. So I improvised and made this piece go vertically as well! I will continue adding pieces of yardage until the backing is wide enough, and then I will add those red strips that I decided not to use earlier to the top and bottom of the quilt top horizontally. I think that will add a nice pop of color at each end of the back. Do you get creative when piecing the back of a quilt, or do you like to stick with one fabric or even just an inexpensive cut of muslin? Any way you do it is great, as long as you like the result! For this wall hanging quilt made from siggy swap blocks, I recycled the lining from an old pair of draperies! I piece most of my quilt backs, but I never think to add in extra blocks. Such a good reminder! Thanks! Your quilt backs are soooo nice! Usually by the time I get to the back of the quilt I'm so sick of the darn thing that I just put together a solid backing. Maybe if I let the top sit around for a while I'll become more energetic, but I doubt it.